How much should a newborn eat? This question comes up a lot, as no parent wants to feel that their baby is eating too little or too much. Parents wonder how to set up a newborn feeding schedule, how often they should feed a baby and how many ounces a newborn should eat. Whether you choose to breastfeed or bottle feed, the following information can help you make informed decisions about feeding your newborn. How often should I breastfeed a newborn baby? Experts say that newborn babies need to eat about 12 times per day. This means that your newborn will be ready to eat about every two to three hours. Since breast milk is easier to digest than formula, it moves through a baby’s digestive system faster, meaning that a breastfed baby may be hungry more often than a bottle-fed baby. Breast milk is loaded with nutrients. Colostrum, the very early milk, contains antibodies that help babies stay healthy. 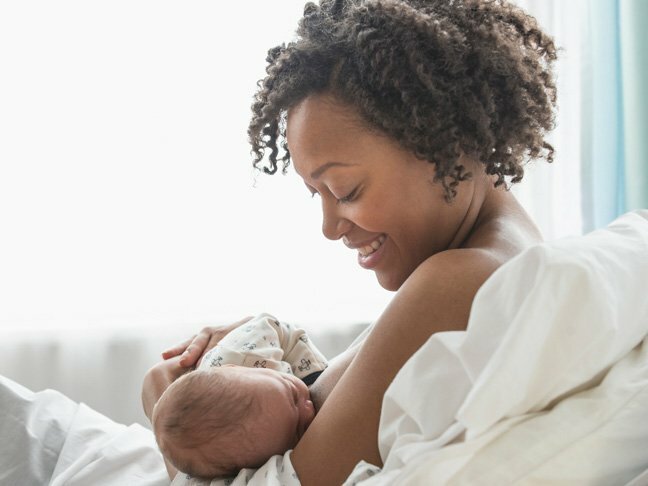 For this reason, many women who plan to bottle feed a child after returning to work will breastfeed while they are at home as breastfeeding short-term can provide some lasting health benefits. When formula-feeding, how many ounces should a newborn eat? It can be tough trying to determine how much a newborn should eat. During the first month, a baby needs two to four ounces of formula every two to three hours. When a baby is receiving formula, she may turn her head away from the bottle or close her mouth when she feels full or needs a break. At this point, try burping her and offer the bottle again. If she is not interested, she has probably had enough formula. Should I provide timed feedings or feed on demand? All babies are different, but newborns usually show signs of hunger. Restlessness, making sucking motions with the mouth, becoming fussy and crying are all signs that baby may be ready to eat. Pay attention to these cues and feed your baby before he or she becomes agitated. Pretty soon, the baby will settle into a routine, and you may be better able to schedule feedings. Some experts recommend that babies be allowed to feed on cue; however, that is a choice for you to make based on your baby’s needs. Should I track my newborn’s feeding schedule? It is not necessary to track your newborn’s feeding schedule, but if you are so inclined, there are some downloadable templates you may use to make tracking easier. There are also several apps that track not only feeding but also diaper changing and other activities. Tracking your newborn’s feeding schedule can help you plan ahead, and when baby goes for check-ups, you can share this information with the healthcare provider. It is important to remember that feeding a newborn is more than making sure the baby gets enough to eat. Feeding is a time for bonding with your baby and helping him or her feel secure and loved.